The name Uxmal, which means “thrice built” or “three harvests”, is a reference to the complexity of this city, which is located in the Puuc hills, a group of mountains where various Mayan cities were settled, breaking the monotony of the Yucatán plains. Its peak occurred during the late and terminal Classic period. It is considered to have been the most important city of the Puuc region, covering an area of 12 square kilometers and housing close to 20,000 inhabitants. The Mayan ruins at Kabah are located along what is called the "Puuc Route", named after the many sites around Uxmal where the Maya Puuc style of building can be found. One of the most prominent buildings at Kabah is the Palace of the Masks. This large building´s Chenes-style facade is completely covered with 250 masks of the rain god Chac, who is sometimes called “The Big Nosed God.” It is one of the most impressive in Maya architecture. Similar to other sites in the Puuc region, the people of Kabah were dependent on rain to water their precious crops of corn. Thus the devotion to Chac. Located in the town of Chocholá, about 20 minutes from Merida, is the Cenote of San Ignacio, also known as the Tuunich Ha, which means "water in stone" in Mayan. This beautiful cenote is underground, inside a cave. 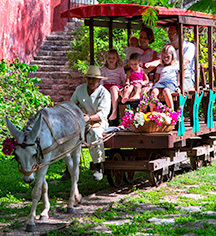 Choco-Story Uxmal is located in a botanical garden, which includes several varieties of cacao trees. 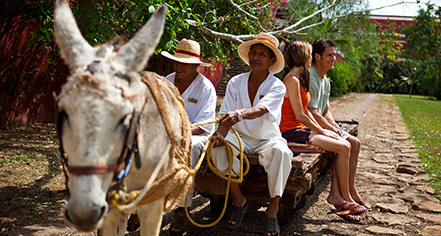 It is a sensory museum where visitors will be able to taste a natural cacao beverage, watch the live crafting of hand-made ceramics by regional artisans, experience a Maya ceremony, and spend time with the animals at the fauna refuge of the Environmental Management Unit for Wildlife Conservation. This palace was built 100 years ago, as the residence for General Francisco Cantón Rosado, a well-known politician, entrepreneur, and military man. Currently Palacio Cantón houses the Regional Museum of Anthropology, a dependent of INAH (National Institute of Anthropology and History). The permanent exhibit is on the lower floor of the museum, where nearly 1,000 items are on display, a product of the archaeological investigations carried out in the interior of the state. Each one of these objects is a source of information about the history of the area’s ancestors.